This cookie recipe can easily be mixed either by hand or with an electric mixer. 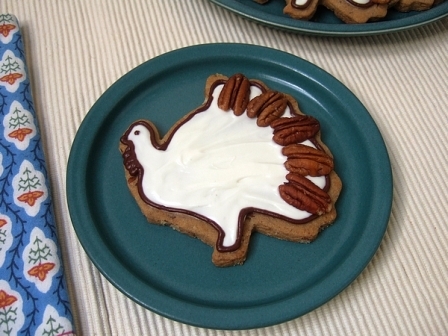 If you want to make turkey cookies like the ones pictured above, you will need about 60 small pecan halves for decorating the finished cookies, in addition to the pecan pieces for the cookie dough. Wrap dough in plastic wrap and chill until firm. Preheat oven to 350 degrees. Roll dough out on a lightly floured counter to 1/4 inch thickness and cut with your favorite Ann Clark cookie cutters, then transfer cookies onto cookie sheets that have been lined with parchment paper or silicone liners. Bake 8 to 10 minutes, until lightly browned around the edges. Let cookies cool slightly on cookie sheets, then transfer to a wire rack to cool completely. Frost cookies if desired before serving. My favorite shapes for Brown Sugar Pecan Cookies include the Turkey cookie cutter, the Pumpkin cookie cutter, and the Oak Leaf cookie cutter.